Surrounded by three beefy Cowboys, Casey Benson leaped for the rebound and popped from the scrum with the basketball. Midway through the first half with Oklahoma State, Benson had provided an essential stop in the game. His stat line for the contest wasn’t impressive—two rebounds and a steal, no points, but Benson was an unsung hero in the game. He didn’t start, but he provided essential minutes down the stretch and was in the game at the end of the half and for the final stretch. Benson wasn’t the only hero Friday afternoon. There are a bunch of heroes on the Oregon basketball team; undersized kids relying on speed and grit to win against presumably better teams. Oregon is a team which was predicted by those in the know to only finish eighth in the Pac-12 and out of the money for a tournament bid. But Dana Altman forgot to read the prognostications. In perhaps the best coaching season of his career, Altman has built a team battered by off-season woes into a band of unlikely heroes who have claimed second in the Pac-12 and a spot in the conference championship game. With his efforts, he earned honors as the conference’s Coach of the Year. By season’s end, Altman’s rotation has slimmed down to seven players. In the crucial last-gasp minutes of the game, Benson, the hands guy, rotates with Jordan Bell, the defensive stopper. Dewayne Benjamin provides speed at forward and high-flying dunks. Jalil Abdul-Bassit is a three-point specialist and can drive to the basket. But the core of the team is the trio of Joe Young, Dillon Brooks and Elgin Cook. Against Oklahoma State, Oregon battled and vanquished a team with two seven-foot players. To survive and advance in the tournament, they’ll have to do the same, beat bigger teams. Those in the know don’t realize that Oregon’s been competing against such teams all season. They’ve beat UC Irvin who has the tallest player in the NCAA. Down the stretch, they beat a highly regarded Utah team twice. 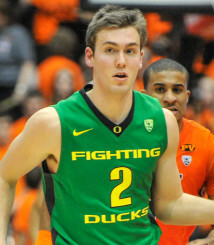 Some think Altman is a magician with what he’s done with this year’s edition of Duck basketball. There is magic in this team, but more than that there’s sound fundamentals, drive and some damn fine coaching. Don’t discount Benson and the other Duck heroes out in the coming games; they’ve been exceeding expectations all season.